In addition to the spin characteristic, fermions have another specific property: they possess conserved baryon or lepton quantum numbers. Therefore, what is usually referred to as the spin statistics relation is in fact a spin statistics-quantum number relation. 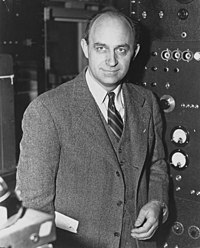 The name fermion was coined by English theoretical physicist Paul Dirac from the surname of Italian physicist Enrico Fermi. Most Standard Model fermions are believed to be Dirac fermions, although it is unknown at this time whether the neutrinos are Dirac or Majorana fermions (or both). Dirac fermions can be treated as a combination of two Weyl fermions. :106 In July 2015, Weyl fermions have been experimentally realized in Weyl semimetals. ^ T. Morii; C. S. Lim; S. N. Mukherjee (1 January 2004). The Physics of the Standard Model and Beyond. World Scientific. ISBN 978-981-279-560-1. ^ Weiner, Richard M. (2010). "The Mysteries of Fermions". International Journal of Theoretical Physics. 49 (5): 1174–1180. arXiv:0901.3816. Bibcode:2010IJTP...49.1174W. doi:10.1007/s10773-010-0292-7.